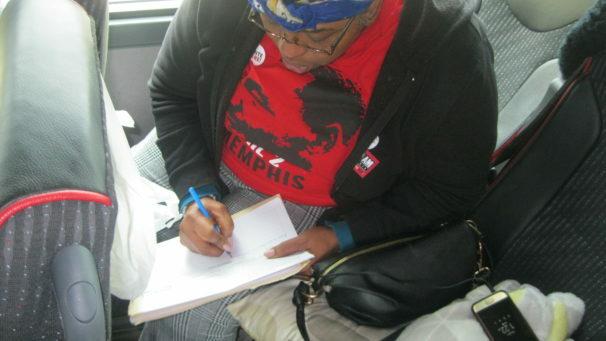 NEW HAVEN, Conn.—”Love, strength, unity,” was how bus captain Linda Booker summed up the 26-hour bus trip to Memphis, Tennessee for I AM 2018. A member of UNITE HERE, Booker was one of 200 from New Haven and 2,000 from across the country to heed the call of their union and travel to Memphis to be part of the mobilization 50 years after Rev. Dr. Martin Luther King, Jr. was assassinated while supporting striking sanitation workers. Organizing for the trip was led by the national Black Leadership Committee of the union. Among those who came were food service airport workers organizing for union recognition at United Airlines, and casino and hotel workers bargaining for contracts in Las Vegas. They took inspiration from the courage of the sanitation workers and the support they received from King, uniting the labor and civil rights movements. 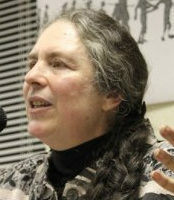 The New Haven buses were filled with members of UNITE HERE Locals 34, 35, and 33 at Yale University, and their community affiliate, New Haven Rising. 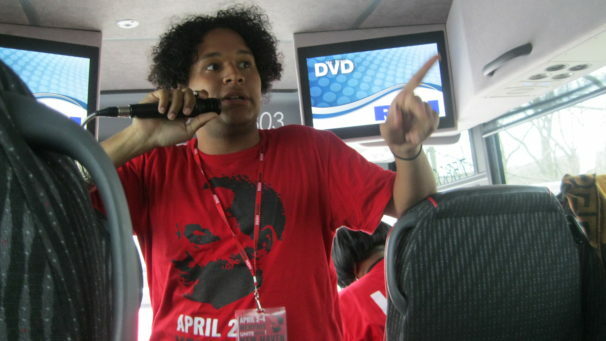 Members of different churches, unions, and the Communist Party shared the bus. It was a family affair. The oldest on Booker’s bus was her mother, Pastor Betty Marks, who turned 81 three days later. The youngest was her four-year-old nephew. Documentaries about the sanitation workers strike, the civil rights movement, and King broke up the long and arduous trip and sparked a lively discussion about how the labor movement and the civil rights movement are interconnected. “Both are fighting for equality and justice,” was one comment. “Both have the same enemy,” was another. Mostly people made the decision to come on the four-day trip because they wanted to make history. “We are like the Freedom Riders!” declared nine-year-old Hank. 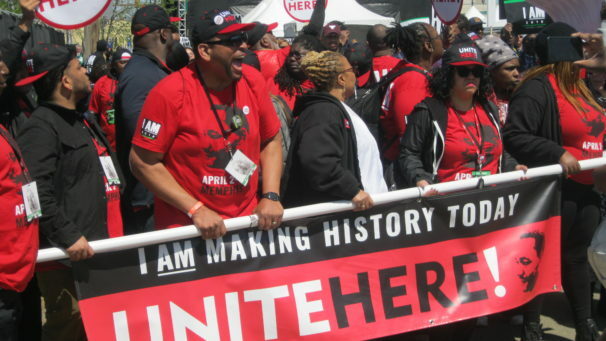 After a packed two-day schedule including a labor panel at Mason Temple, a UNITE HERE dinner and rally, the re-enactment of King’s Mountaintop speech, and the huge, powerful national rally and march on April 4, everyone was tired, but very inspired, and ready to respond to the call to action. “I brought my three kids to be part of making history for what we are fighting for every day. We are the pebble that makes the wave,” said Chachie Roman. Just being present at the Mason Temple in the sanctuary where King made his last speech before he was killed was very emotional. A labor panel and re-enactment of the Mountaintop speech were held there. UNITE HERE members also had a chance to hear the surviving sanitation workers, past AFSCME leader William Lucy, civil rights leader Rev. James Lawson, and their own union leaders at a special Tuesday evening rally at nearby Deliverance Temple. The atmosphere in the room was electrified as Rev. 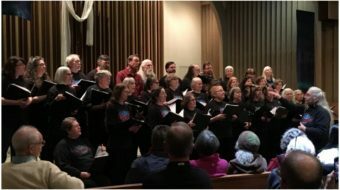 Scott Marks called on everyone to speak to people they did not know, and the UNITE HERE choir brought everyone to their feet in song, recognizing each union local in the room to cheers and applause. 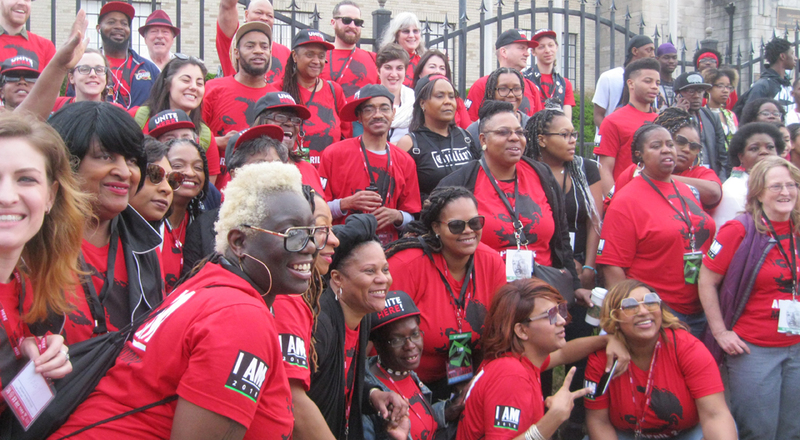 The next morning, UNITE HERE members joined with many thousands of workers from other unions, churches, youth, immigrant rights, and civic organizations, cultural artists and elected leaders, proudly marching from AFSCME headquarters a mile and a quarter back to Mason Temple. As the buses were served box lunches for the long trip back to Connecticut, a feeling of unity and optimism for the coming battles filled the air. The national mobilization in Memphis exemplified the idea that unions and community have the same interests and can win gains for all working people by joining together. In New Haven, the joint efforts of New Haven Rising and the Unions at Yale have forced the University to open up more jobs to residents of the city in Black and Latino neighborhoods with highest unemployment that have been locked out of these jobs in the past. In the spirit of unity, a representative of the immigrant rights group Unidad Latina en Accion asked for support of an effort to enact an ordinance in New Haven to make its sanctuary city policies permanent. As the petition passed up and down the aisles, people were eager not only to sign, but to get extra copies and bring them to union meetings.